We're very happy to introduce a new weekly series here on MLP entitled "Things I Learned from Michael Jackson". It will feature personal stories and creations from our lovely MJ-family about the ways Michael has touched our lives and hearts. Whether through obvious experiences or subtle, long-evolving influence that leaves one in awe upon later introspection, the lessons we've learned by being Michael's fans have been about living, loving and spirit, about the practical and the profound, from striving for excellence and believing in yourself to strength and innocence... there's so much. Sometimes even a spark of an idea or emotion can ignite a search for understanding and growth. It is a wonder of life to be blessed with the gift of such guides and teachers, often unrecognized at the time, who by their very presence transform us so deeply that we later wonder who or how we'd be without them. Michael is one such teacher for many, leaving us changed. And we continue to change - forever discovering ourselves, each other, our oneness and how to change the world - all enfolded in a mystery of love. When this new topic for the Major Love Prayer website was first mentioned to me, my reaction was one of shock and awe, at first, because I had been thinking of doing something similar. It always amazes me when my friends and I have the same inspirations though separated by miles and connected only through the technology available to us through email and social networking sites. It’s a phenomenon I’ve written about before on With a Child’s Heart in a blog post entitled Our Love’s An Ocean from October, 2010, I believe. In addition, it’s a phenomenon that, at this point, almost two years after that fateful day in 2009 when our breath was taken from us … can only be explained in one way. I challenge anyone to find another explanation for it regardless of how long or deep he or she searches. When I had recovered … and after I had thanked Michael Jackson for inspiring the thought in three of us at the same time (because there was another of my friends creating a poster at exactly the same time which inspired my thought and which was inspired by my friend’s idea) … I began to try to think of the most important lesson my Beautiful Teacher had taught me. This turned out to be a major undertaking because there are so very many lessons I have learned from Michael (many of which I have not totally assimilated or put into practice, but which I see very clearly in his example of a life well-lived.) From my first experience of Michael in 1992, he has been teaching me; and I pray that he goes on teaching me until long after I leave this Earth behind in my quest to follow him wherever he may lead. God didn’t just drop us here and forget about us more than two thousand years ago, She still checks in on us now and then and He still cares about us and wants us to be happy! She still has a Plan and that Plan is perfect in its scope and in its execution. What’s more, our wonderful Eternal Oneness has a wicked and irrepressible sense of humor. How did I arrive at this conclusion? Well, let me explain. I was aware of God before Michael Jackson entered my life. One has to be aware of God growing up as a good Catholic girl and enduring 12 years of Catholic education. I was always fascinated with mysticism and spirituality, even as a youngster (was even playing with the idea of devoting my life to God as a nun back in those days), but my thoughts of God were always abstract rather than concrete, real possibilities to which human beings could aspire, strive toward and actually achieve through backbreaking effort and heartrending drive. I was brought up to believe that no one could aspire to that kind of perfection; it was almost blasphemous to attempt such a commitment. Before Michael entered my life, I didn’t think a book written more than two thousand years ago … or a Man who walked in poverty and died a violent death … could possibly have any relevance to the modern, sophisticated, technological age. How could the outmoded ideals of a Man who owned one pair of sandals speak to the street-smart, savvy citizen of a capitalistic 21st Century which has evolved into owning dozens of pairs of lethal stilettos? What of import and relevance could He, with one cloak to his name and outdated ideas of economic solvency, have to say to someone struggling with paying taxes and raising children and being bombarded by the games people play? What meaning could a concept like abstinence possibly have to a post-free love culture in which sexual activity has become a right of passage almost at the onset of puberty, an expression of personal freedom and independence … and even a weapon in the most violent of our young people? How can our modern society relate to the concept of self-sacrifice when in our vernacular it means nothing more than foregoing candy during Lent? Here was a man who lived the words of that book on the world stage in full, glorious view of the entire planet with style, panache, humor, innocence and humanity. Here was a man who walked the steps that Man of two thousand years ago had walked with grace, compassion, humility and humor. Here was a man who spoke the same words that book contained with more feeling, more meaning and more depth than any printed page can render. He brought the book to life with his example … and in his performance and visual art. He brought the Man into our modern world with wit and charm, foregoing the antiquated jargon and speaking in a language that the whole world could understand; he gave that Man a presence in our modern age that had been denied Him by the passage of time. Michael Jackson updated that Man’s image; he reinvented Him for a more consumer-driven culture, remaining true to His character and espousing His ideals and at the same time, remaining steadfastly committed to achieving the perfection that my fifth grade teacher (Sister Mary something, I really can’t remember that far back) touted as unattainable because human beings are flawed with original sin from the get go! Michael Jackson wasn’t! This man captured the attention of an entire planet and held it with his magnetic charisma until his last breath on this beautiful planet … and, in at least my case, but, I think also in many of yours … continues to do so! He sang and danced his way across a world … and into our hearts … showing us all how to interpret words we had heard all our lives from our parents and Sunday school teachers and pastors in new ways by visiting sick children in every city he visited … not once … not even twice … but every time he went on tour; by giving the entire proceeds of a world tour (millions of dollars) to charities and hospitals and orphanages in every city he visited; by singing about our world and how to heal it … and ourselves. 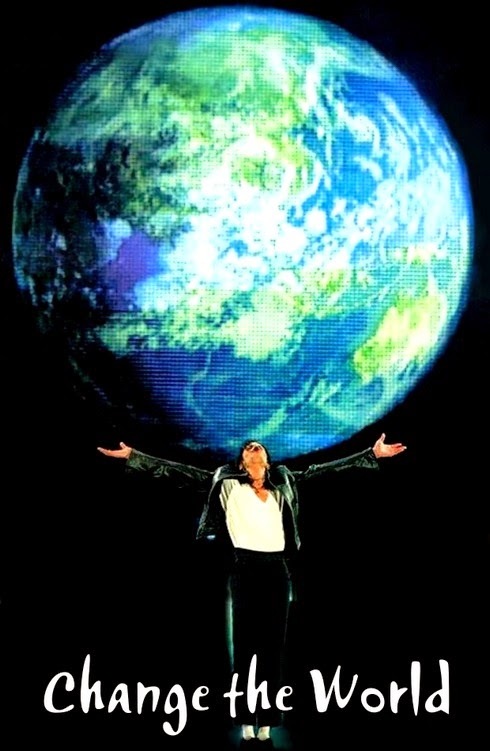 Michael Jackson embodied God’s Love and when he reached his arms out on all those thousands of stages, he said an emphatic “Yes, please use me,” to his Higher Power and he embraced an entire ecosystem within their span! And we all felt it regardless of how far from those stages we were in either time or space. He personified … and continues to personify … God’s Plan for His human children; and he brought that Plan up-to-date in a way that I couldn’t even have imagined before he grabbed my attention with infectious rhythms and powerhouse performances and imaginative short films. So, in conclusion, I believe the most valuable lesson my Beautiful Beloved ever taught me was that God is still alive and engaged here on our little speck of dust hurtling through space. Who would have anticipated such profound lessons coming from a rock ‘n roll idol of unprecedented global outreach? There’s that wicked sense of humor I mentioned. Thank you, Michael! You are always in my heart! Thank you Jan, for saying this so well. People ask, "What would Jesus do?" Well, I wasn't around to see Jesus, but I have seen Michael, and the question for me becomes,"What would Michael do?" Yes, we absolutely have seen an example of how to live...It's called, Love everyone and everything MORE! Michael was definitely God's instrument, and through him, God played the most incredible music. The kind that pleases the ears and heals the heart. Thanks for sharing this story, Jan. What a perfect story to begin this series of what we each learned from Michael, our master teacher. First of all, I want to thank you for such a beautiful post, no need to say I'm willing to read the next chapter! You really touched me with this, because I also "found" God when Michael passed away. Let me explain it (I hope I can do it, since this is the first time I actually say it to someone). I spent 10 years at school. Not even 1 day I was happy there. It was a catholic school (owned by Opus Dei) - which means, if you don't agree with them, they destroy you. I suffered many years of physical abuse, and when I was old enough to defend myself, they started the destruction stage: mental abuse. 6 years passed by, and Michael was gone. I experienced something I would call "inner enlightment" - I started wondering who I was, who I wanted to be, what I become... and I didn't like it. So I changed myself completely and learned that Forgiveness is as important as Love. So, one night, the enlightment came to me. If I experienced all that pain and suffering, was because God was trying to teach me. As Michael said several times, I would never change my past, for it made me who I am now. God made me see that, if it wasn't for my past, I wouldn't be like that. He made me suffer, yes. But he did it for my sake. So I'm grateful to him, but specially grateful to Michael. It was him who made me see this - through his interviews, speeches... His words entered my soul and the hate turned into compassion. The same people I wanted to hurt years ago, now I feel sorry for them, for they don't know what they're doing - they're in fact hurting themselves. I don't know how, let alone why, Michael's words touched me so deeply. But they did. And I believe he was the best teacher we could ever have. Thank you Jan for your eloquent way to put into words what so many of us recognize beyond a shadow of a doubt. I was raised religious too although not Catholic, still am religious but when Michael died, my heart opened for spiritual experiences, thereby broadening my horizon and getting a deeper understanding and compassion for the different people around me. A wonderful contribution and I hope to read many more in this series! Thank you for the post! I am glad I'm not the only one who got a major awakening after MJ left. I can say it has been a major journey for me since that day. I have learned so many things e.g THE SECRET and many more which are phenomenon! By applying these ancient Truths I have been experiencing the presence of GOD our SUPREME FATHER & MOTHER. HE is always there for us but there is one thing we have to do; LOVE. Unlike most of us, Michael is a special child of God. God is before everything and everyone. God has never 'not' existed, 'not' cared. Our flawed human willingness to accept, understand and believe is the only variable. Michael's purpose is not to show us, to prove to us, that God exists, or still exists, but to draw us to the experience of life inside of believing, life held wholly within the caring, nurturing, saving, perfecting love of God. There have been, are and will be many, many others who speak about, teach about and work to draw people to, or back to, God. An estimated 3 billion of the world's 3.9 billion people believe in God. Of these, approximately 1.3 billion are Jews or Christians, the primary population with whom Michael had opportunity to connect. If you consider the fact that Michael's devoted, loving fan base - who are impacted, taught, encouraged, motivated and drawn to God's message of love by Michael - adds up to multiple millions of people across our globe, Michael's significance in the faith community cannot be discounted. The fans understand this, but the general population does not, yet. 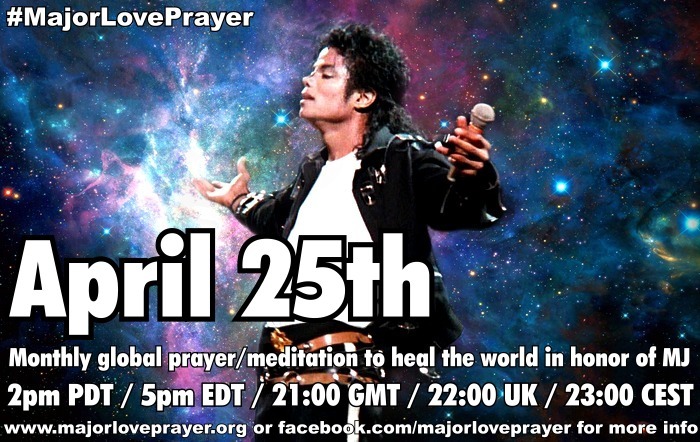 It will, though, as the world sees the power of Michael's teaching and message of love. Providing evidence of this is our assignment, responsibility and privilege. How seriously we take, how devotedly we labor, how effectively we demonstrate, how eternally we embrace Michael’s message remains to be seen. We are capable of great things. Michael knows this because God knows this. In Matthew 6: 10, Jesus taught us to pray for His Father’s, our Father’s, kingdom to come on earth. 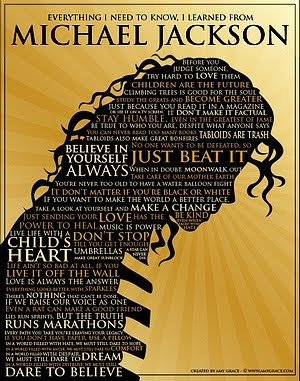 Michael’s message is held in a single word: LOVE. The elaboration of his message is Matthew 6:10. What Michael hoped and prayed and labored for, what Jesus taught us to pray for, is that God’s kingdom, without our having to wait until we have eternal life with God in heaven, be given to us here on earth. The inferred, deeper truth of this scripture is that God’s kingdom can exist on earth. It is simply (which is not the same as easily) up to us to live in ways that assure this. Everything Michael offered to, encouraged for and asked of us is for this result. If we live in love, then we always serve each other, then there is nothing that can stand against us, then we are unity, then God’s will is done, then God’s kingdom can come, on earth as it is in heaven. The words are 2000 years old. The message is as old as the beginning of time, when ‘God created the heavens and the earth’, when ‘God created mankind in his own image’. Michael came as a child of God to teach us in a contemporary voice, but his message to us is His forever message to us. Are You Listening? I am overcome with emotion... so all I can say is THANK YOU! You are not alone feeling this way. It is because of Michael that I believe in God. That is a long story but believe me, he lead me to believe in God and in love again. It is the most wonderful gift. Thank God for Michael.